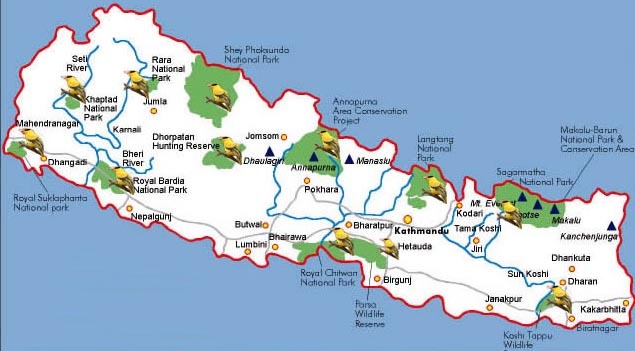 Sagarmatha National park was gazetted in 1976 and lies in the Solu-Khumbu District of the north-eastern region of Nepal. The park covers 114,800 ha and encompasses the upper catchment of the Dudh Koshi River system. It is enclosed on all sides by high mountain ranges. The northern boundary is defined by the main divide of the great Himalayan range which forms the international border with the Tibetan Autonomous Region of China. In the south, the boundary extends almost as far as Monjo on the Dudh Koshi ( Green 1993). The park is a spectacular mountainous area with seven peaks over 7,000m. including the world's highest mountain Sagarmatha. Most of the park (69%) comprises barren land over 5,000m. 28% is grazing land, and nearly 3% is forested (Sherpa 1985 in Green 1993). In the subalpine zone. 3,000-3,800m. There are forests of blue pine pinups wallichiana, fir Abies spectabilis, and juniper juniperus recurva and birch rhododendron forest ( Betula utilis, Rhododendron campanulatum, and R. campylocarpum). Higher up in the lower alpine zone above the tree line at 3,800-4,000m. ther are shrubberies of janiperus spp. Rhododendron anthopogon and R. leoidotum. Grassland and dwarf shrubs grow in the upper alpine zone, 4,5000-5,500m, and cushion plants from 5,500m. to 6,000m. Oak Quercus semecarpifolia was formerly more extensive but only small areas now remain (Green,1993).Sagarmatha (mother of the universe')and its surrounding are the international importance, representing a major stage of the earth's evolutionary history and one of the most geologically interesting regions in the world. Its scenic and wilderness values are outstanding. As an ecological unit,the Dudh Koshi catchmenti is of biological and socio-economic importance, as well as being of major cultural and religious significance (blower 1972). Day 01: Arrival in Kathmandu, meet and transfer to hotel. Day 02: Bird watching tour to Phulchoki and drive back to KTM. Day 03: Fly to Lukla. Day 04: Trek from Lukla to Namche. Day 05: Trek from Namche to Phortse. Day 06: Rest at Phortse for acclimatization. Day 07: Trek from Phortse to Luza. Day 08: Trek from Luza to Gokyo. Day 09: Trek from Gokyo to Dole. Day 10: Trek from Dole to Thyangboche. Day 11: Rest at Thyangboche. Day 12: Trek from Thyangboche to Namche. Day 13: Trek from Namche to Lukla. Day 15: Drive to Koshi Tappu. Day 16: Full day bird watching inside the Jungle. Day 17: Full day bird watching tour. Day 19: Drive to Hetauda for IBISBILL tour. Day 20: Drive to Chitwan. Day 21: Full day bird watching in Royal Chitwan National Park. Day 22: Drive back to Kathmandu via Daman. Day 23: Half day Bird watching in Nagarjun forest. Day 24: Final departure from Kathmandu. The size of your group. 1 to 3 pax US$ 88 to 163 P/p per night. 9 to 14 pax. US$ 75 to 135 P/p per night. Single supplement US$ 40 to 70 per night. Note: The itinerary and cost for Peak climbing, Mountaineering, Tibet, Bhutan and India tours and trek are conditional apply. Notwithstanding the costs shown above, we can tailor tours to suit almost any budget. Feel free to email us for more information. Note: One tour leader will be free of cost for tours with 15 or more paying guests only. Children's bellow three years is free if sharing with their parents. And need to pay if they are participating on the trekking, and above three to nine year children half of the price. Cost Includes: Accommodation in 3 to 4 star hotels in the cites as your choice, basic accommodation in a lodge or tea house or camping (depending on your itinerary and choice) during treks, guides and porters on treks, all land transfers by private vehicle, 3 meals a day on treks, all jungle safaris, all sightseeing tours as per itinerary and all necessary entry fees, permits and airport transfers. Cost Excludes: Personal expenses, domestic air tickets, airport tax, drinks (soft drink, mineral water and alcoholic beverages and hot-shower on the trek), personal insurance, and extra cost due to natural calamities or accidents outside of our control. Remarks: The cost of the trip determines with the services included during the trip so that it might be varies with the services, hotel and transfer of your wish. Please note that our guides speak the following English languages and if required we will provide your language spiking guide on extra cost.